Share markets mostly rose over the last week, helped in particular by a favourable reaction to the US midterm elections. Chinese shares remained under pressure though. Bond yields continued to rise reflecting the “risk on” tone from investors and as the Fed showed no signs of pausing its rate hikes. Commodity prices were mixed though with oil falling further and metal prices down but the iron ore price continuing its ascent. While the $US rose slightly the $A got a boost from the RBA upgrading its growth forecasts. The big surprise from the US midterm election was that there was no surprise! Unlike with Brexit and Trump’s election in 2016 the polls and betting markets were spot on! So why did shares rally? There are basically three reasons. First, while the Democrats now control the House it wasn’t the “blue wave” some had talked about as the GOP also increased its Senate majority. Which means while another round of tax cuts is unlikely the Democrats won’t be able to wind back Trump’s first round of tax cuts and it won’t be able to re-regulate the US economy either. Similarly, while the Democrats will likely harass Trump with investigative committees and maybe even impeachment proceedings they won’t get the 67 Senate votes necessary to remove him from office. (Unless of course Mueller or others can show he has done something really bad mind you Trump’s decision to sack Attorney General Jeff Sessions doesn’t inspire a lot of confidence on this front!). Second, just getting the midterms out of the way provides relief. Finally, US shares have rallied over the 12 months after each midterm since 1946 as the president refocuses on re-election. Trump is likely to do the same and this means doing nothing to weaken the economy and fixing the trade war with China sometime in the next six months. In terms of the latter while Chinese President Xi Jinping in a speech in the last week made veiled criticism of Trump’s protectionism he also indicated ongoing tariff cuts on imports and a tightening in protection for intellectual property with China’s Vice Premier Wang indicating that China remains ready for negotiation on the trade issue. There is a long way to go here but it is likely that a deal will be made with China before the tariffs are allowed to cause too much damage to the US economy. 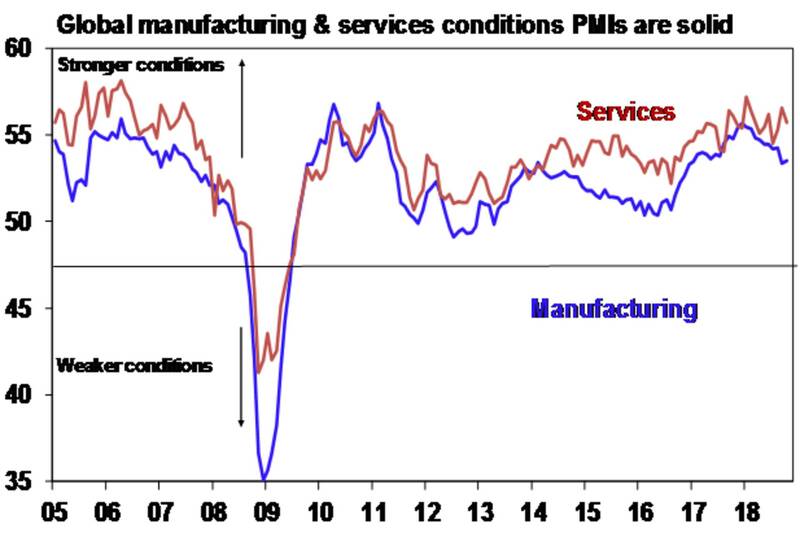 Global business conditions PMIs in October remained down from their highs earlier this year, but in aggregate they remain solid. No sign of a significant global economic downturn here. That said the global economy has become less synchronised with the rest of the world slowing relative to the US. A rising US dollar may help to reverse this a bit next year as its provides a competitiveness boost for the rest of the world relative to the US. US sanctions on Iran kicked in but the oil price is down 20% from its October high. So what happened? Basically a bunch of things happened: Iranian exports have already fallen as the sanctions were announced in May; the US granted sanction waivers on eight countries including China, Japan, South Korea and India; US inventories have been rising; and the market got all geared up going into the sanctions and so has been cutting long oil positions. 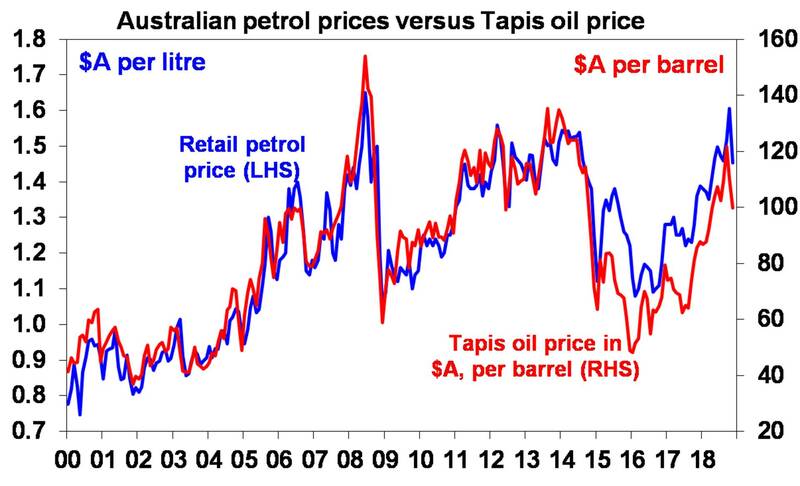 This is good news for Australian motorists with petrol prices plunging from an average over $1.6 a litre a few weeks ago to now falling back to around $1.45 and prices could still fall another 5 cents or so as the oil price fall flows through to the bowser with a lag. However, don’t get too excited as the world oil market is now getting very tight with the Iranian sanctions suggesting that the rising trend is at risk of resuming. US economic data releases remained strong over the last week. The ISM non-manufacturing index remained very strong in October, job openings, hiring and quits remained solid in September and jobless claims remain ultra-low. Meanwhile, the Fed made no changes to monetary policy but remains upbeat on the US outlook and continues to see gradual rate hikes as appropriate, which leaves it on track for another 0.25% rate hike next month. At this stage a December hike is only 74% priced in by the US money market and the market’s interest rate expectations over the next two years remain too dovish relative to the Fed’s dot plot expectations (by around 0.5%). The US September quarter earnings reporting season has proven to be strong. 90% of S&P 500 companies have now reported September quarter earnings results with 82% beating on earnings against an average this decade of 75%, 60% beating on sales and earnings growth expectations for the quarter have now moved up to 27% which is 7 percentage points higher than expected going into the reporting season. 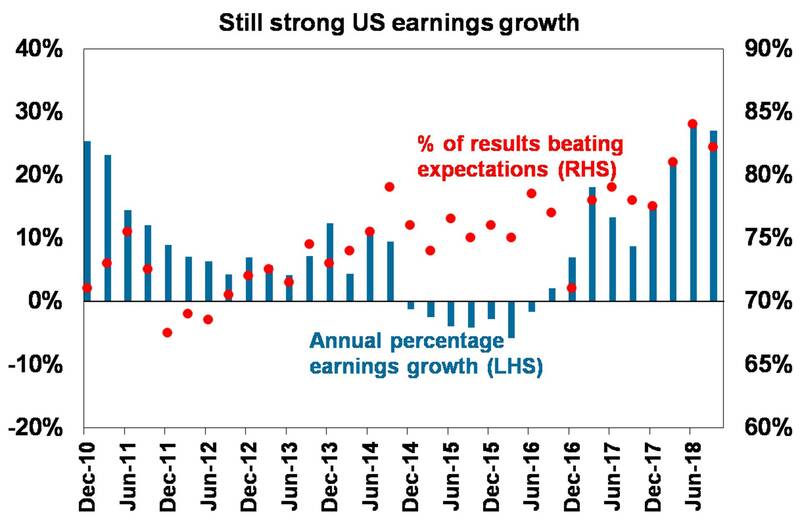 Even excluding the impact of tax cuts profit growth is running around 18% in the US and compares to around 10% profit growth in the rest of the world – which partly explains why the US share market remains relatively strong. Japanese economic data was on the soft side with a fall in household spending in September, very weak machine orders and sluggish wage growth (despite a bit of excitement on this front a few months ago). The Ecowatchers sentiment index showed improved current conditions but a softer outlook. Chinese growth in both exports and imports surprisingly accelerated to solid readings of 15.6% year on year (yoy) and 21.4%yoy in October suggesting little impact from tariffs and solid growth in domestic demand despite fears to the contrary. Survey data and the tariffs suggests the strength in exports won’t be sustained, but stronger imports may be reflective of stimulus measures. Meanwhile, inflation remained benign in October with core CPI inflation of just 1.8%yoy, so inflation is no constraint to further policy stimulus in China. As expected the RBA left interest rates on hold again at 1.5% at its November Board meeting. But its forecast upgrades indicate somewhat greater confidence in the outlook. It could be too optimistic. The RBA’s latest Statement on Monetary Policy saw it revise its growth forecasts for this year to 3.5% (up from 3.25% previously), it still sees growth of 3.25% next year, it now sees unemployment falling to around 4.75% in 2020 (from 5% previously) and it continues to see wages and inflation moving gradually higher. Assessments are that the RBA is underestimating the threat posed by slowing growth in China, tightening credit conditions and a negative wealth effect as house prices continue to fall. As a result, in contrast to the RBA growth could slow to around 2.5-3% through 2019 which in turn will result in higher unemployment and keep wages growth and inflation lower for longer than the RBA is allowing. So, views remain that a rate hike is unlikely until late 2020 at the earliest and that a rate cut later next year can’t be ruled out. Out of interest its doubtful that even the RBA’s more optimistic 2019 forecasts would justify a rate hike next year as they only see wages growth getting up to a still anaemic 2.5%yoy and inflation rising to just 2.25%. Australian data released over the past week was soft with a continuing slide in housing finance commitments, particularly to owner occupiers, a continuing loss of momentum in ANZ job ads and the Melbourne Institute’s Inflation Gauge showing both headline and underlying inflation remaining very weak over the last month. In the US, October data for inflation and retail sales will be the main focus. Expect core CPI inflation (Wednesday) to remain stuck at 2.2%yoy and retail sales growth (Thursday) to remain strong at 0.5% month on month. The Philadelphia and New York regional manufacturing conditions surveys (Thursday) are likely to remain solid as is growth in industrial production (Friday). A speech by Fed Chair Powell (Thursday) will be watched closely for clues on the outlook for interest rates. Japanese September quarter GDP growth (Wednesday) is expected to dip back into negative territory with a decline of 0.3% quarter on quarter resulting in annual growth of just 0.4% due to weakness in consumer spending. Chinese activity data for October due for release Wednesday is likely to show a slight pick up in retail sales growth to 9.3%yoy and investment growth to 5.5% but growth in industrial production unchanged at 5.8%. Data on bank lending and credit will also be released. In Australia the focus will be on wages growth and jobs data. September quarter wages data due for release on Wednesday is expected to show wages growth of 0.6% quarter on quarter with a 3.5% rise in the minimum wage providing a boost but partly offset by a reduction in Sunday penalty rates. This should see annual wages growth rise to 2.3%yoy from 2.1%. Bear in mind though that were it not for the acceleration in the minimum wage, wages growth would be stuck at 2%yoy so underlying wages growth is likely still very weak. October jobs market data (Thursday) is expected to show a 15,000 gain in employment but unemployment remaining unchanged at 5%. The jobs report is always a bit statistically noisy but this one may be more so given the impact of a changing survey sample that seems to be resulting in more variation than normal. The NAB business conditions survey will be also be released Tuesday and consumer confidence data will be released Wednesday. Shares remain at risk of further short-term weakness, but it’s likely to see the trend in shares remaining up as global growth remains solid helping drive good earnings growth and monetary policy remains easy. Low but rising yields are likely to drive low returns from bonds, with Australian bonds outperforming global bonds as the RBA holds and the Fed continues to hike. National capital city residential property prices are expected to slow further with Sydney and Melbourne property prices likely to fall another 15% or so, but Perth and Darwin property prices at or close to bottoming, and Hobart, Adelaide, Canberra and Brisbane seeing moderate gains. Having fallen close to the target of $US0.70 the Australian dollar is at risk of a further short-term bounce as excessive short positions are unwound. However, beyond a near term bounce it likely still has more downside into the $US0.60s as the gap between the RBA’s cash rate and the US Fed Funds rate pushes further into negative territory as the US economy booms relative to Australia. Being short the $A remains a good hedge against things going wrong in the global economy.